ESSEN, 14 March 2019. 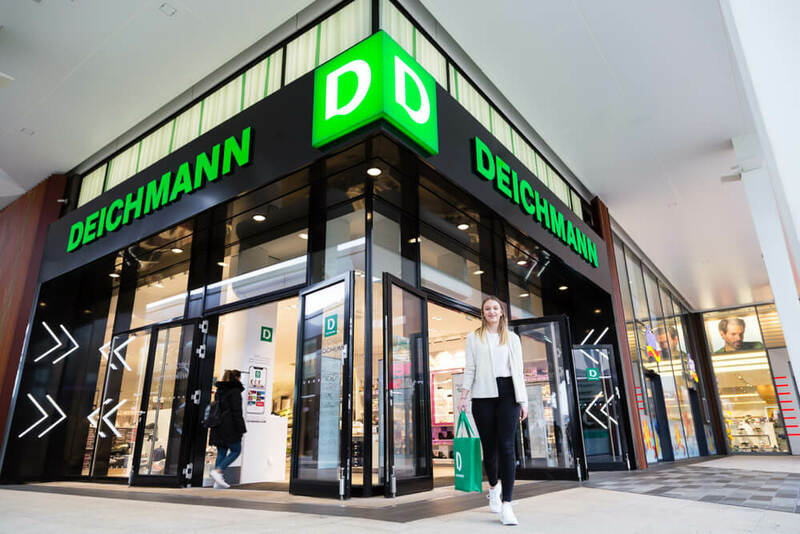 Europe’s largest shoe retailer DEICHMANN continued to grow in 2018 despite difficult market conditions. The group of companies is reporting a plus both in the number of shoes sold as well as in turnover. And the number of stores and online shops has also continued to rise. 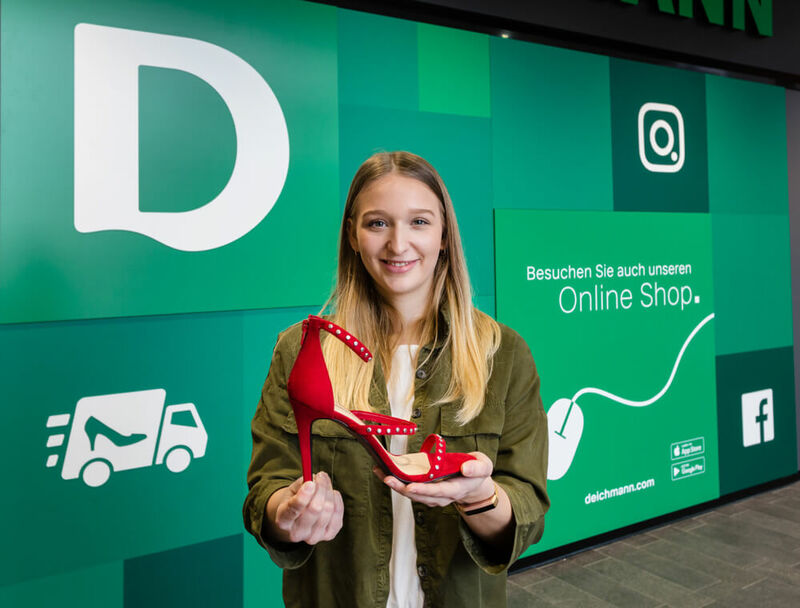 For 2019, DEICHMANN has its sights set on further growth – in its stationary and digital business, as well as in new markets. In the USA, the group made the biggest acquisition in the company’s history by purchasing a chain with more than 60 shops in the streetwear and sports footwear segment. In the past financial year, DEICHMANN SE, based in Essen, Germany, generated a gross turnover of 5.8 billion euros (net: 5 billion euros) in 25 European countries and the USA. The currency-adjusted turnover increase was 2 percent. In 2018, 178 million pairs of shoes were sold worldwide in the stores and via the group’s online shops – just under one percent more than in the previous year. Like-for-like, the turnover remained stable with a slight plus of 0.1 percent. The DEICHMANN Group generates 60 percent of its turnover outside of Germany. On 31 December 2018, it was running 4,053 stores (2017: 3,989) as well as 40 online shops (2017: 36) and employed 40,698 members of staff (2017: 39,564). “2018 was a very difficult year for fashion retail in Europe. The persistently warm weather in particular had a negative impact on sales,” says Heinrich Deichmann, Chairman of the Management Board of DEICHMANN SE. The past year also proved challenging for the DEICHMANN Group. In addition to the unpredictable weather, the company faced increased competition from online-only providers and fashion brands offering shoe ranges. “Under these conditions, we have successfully managed to keep the group stable and bucked the industry trend to achieve growth,” says Deichmann. “The foundation of this is our brand mission of offering affordable, fashionable and high-quality shoes. But that alone is not enough to withstand the competition. In times like these, what sets us apart is the fact that we focused on e-commerce early on and are still further developing our omnichannel activities now,” continues Heinrich Deichmann. Against the backdrop of the current economic situation, extensive growth plans are also on the agenda for 2019. The planned investments for the entire group amount to 285 million euros, a record high. 102 million euros of this total will be allocated to Germany. Investments will be made both in the modernisation of the store network and the opening of new bricks-and-mortar stores, as well as in internationalisation and digitalisation. For 2019, the group is planning on opening 229 new stores worldwide and modernising 256 stores. The group is starting a new chapter with its presence in the Middle East. The first DEICHMANN store will be opening in Dubai this summer – for the first time in the company’s history with a franchise partner. The AZADEA Group is a leading lifestyle retail company that has been operating in the region for 40 years and currently runs over 50 leading international franchise concepts in the sectors of fashion and accessories, food and beverages, home textiles, sports equipment, multimedia and beauty. “We see it as a great advantage for us to develop a region step by step together with a local partner,” says Heinrich Deichmann. If it proves successful, expansion on the entire Arabian peninsula and North Africa is also in the pipeline. In the first half of 2019, the company will also be launching in China where it will offer a selection of its range online via the platform T-Mall Global. For the current year, plans are also being made to enter the Estonian and Latvian markets with the DEICHMANN concept. The MyShoes format, currently represented in Germany, Austria and Switzerland, will undergo further internationalisation with the first stores opening in Poland shortly. An acquisition has already been completed in the USA. There the DEICHMANN Group has taken over KicksUSA. KicksUSA was established in 2002 in Philadelphia and currently runs 64 stores on the East Coast, primarily in the cities of Philadelphia and New York and in the state of New Jersey, as well as an online shop. In the future, the stores of the label will be managed under the SNIPES brand. SNIPES has been part of the DEICHMANN Group since 2011 and has been continually expanding ever since. SNIPES meanwhile runs more than 230 stores in nine European countries and appeals to a similar target group as the recent American acquisition. “We have made a considerable investment in the USA because, backed by our many years of market knowledge, we are convinced that we can make an impact here, in a segment that promises long-lasting growth,” Heinrich Deichmann explains the greatest acquisition in the company’s history. The DEICHMANN Group first became active in the USA in 1984 with its takeover of Lerner Shoes. This evolved into the chain Rack Room Shoes, whose shopfitting concept, with a mix of self-service and shop assistant service, DEICHMANN brought over to Europe. It was then established by the company in Germany and later in the rest of Europe as a standard that has long since become common practice in shoe retail. Together with the chain Off Broadway, which it acquired in 2001, the DEICHMANN Group meanwhile runs over 520 stores in the USA (as of December 2018). To further enhance its digital expertise, DEICHMANN will also be working with additional external experts in this field. In the future, the company will therefore further reinforce its profile as an attractive digital employer that offers interesting international development opportunities at a corporation with currently 40 online shops in 26 countries. The new “Deichmann Digital” website will also be launched soon. DEICHMANN will once again be working with an international testimonial in the autumn/winter season. However, the name is still currently being kept under wraps. In Germany, where the framework conditions for the fashion retail trade proved particularly difficult in 2018, the group was almost able to reach the level of the exceptionally good previous year. Last year, it sold 73.4 million pairs of shoes in 1,461 stores and online. Sales were therefore roughly at the previous year’s level, as was the turnover of 2.3 billion euros. At the end of 2018, the DEICHMANN Group employed a staff of 16,271 in Germany (2017: 15,977), including around 3,000 apprentices. Around 400 new recruits are planned for 2019. In 2018, 1,253 young people began an apprenticeship with the group in Germany. For the first time, the company also offered an apprenticeship in e-commerce. And over 1,000 new apprentices will be employed again this year. DEICHMANN SE continues to have its headquarters in Essen, Germany, right next to the shoemaker’s workshop that has been the nucleus of the company since 1913. A staff of more than 900 is meanwhile employed at the head office in Essen. After around 16 months of construction work, a new office and administrative building was completed in autumn 2018 on the grounds of the company headquarters. The new build will bring around 120 additional jobs to the existing head office. DEICHMANN has invested more than six million euros in the project. For 2019, the group is planning 30 new stores and the modernisation of 110 stores in Germany. A particular highlight will be the DEICHMANN flagship store in Munich, which is due to open this summer. For the store in the “Joseph Pschorr Haus” at Neuhauser Straße 19–21, DEICHMANN will develop an individual concept incorporating new highlight elements, large screens and an attractive omnichannel area. The extensive offer will be showcased on a sales area of more than 2,000 m² spread over two floors. “The company must serve the people” – this has been the philosophy of the DEICHMANN Group’s corporate mission statement from the beginning. The owner family and the company itself therefore take an active role in a variety of social projects both in Germany and abroad. This is made possible, on the one hand, by Christian aid organisation “wortundtat”, a registered association established in 1977 by Dr Heinz-Horst Deichmann († 2014). The catalyst for this was his encounter with leprosy sufferers in the underdeveloped south of India. What started out as a village project has meanwhile developed into an aid organisation that has benefitted over 250,000 disadvantaged people in India, Tanzania, Moldova, Greece and Germany. The focus of its work is on education and medical care, carried out exclusively with local specialists. Helping people to help themselves is always the goal. In 2015, Heinrich Deichmann took over the chairmanship of the non-profit association as his father’s successor. In addition to the regular aid provided by “wortundtat”, last year Heinrich Deichmann promoted the support of various projects through the company’s own foundation. One focus was on helping refugees in their countries of origin as a way of tackling the reasons behind them fleeing. It supports, for example, charitable organisations in Yemen, South Sudan and Lebanon that provide humanitarian aid for populations in need, and in particular for refugees.